Don't simply feel better, become better! We provide mind & body healing that ensures you are balanced so your dreams become a reality. Contact directly, your new life starts now! Dr. Judd is a Boulder-based educator shaped by over 20 years of experience as a performance-enhancement coach, teacher, and athlete. I am from a small town and like most kids from small towns, I found trouble. My parents made the difficult decision at the age of 12 to take a drive to the only place they knew for help; Fork Union Military Academy in Fork Union, Virginia. At first, I cried myself to sleep each night. Gradually, I discovered that I was part of a brotherhood guided by faculty that were dedicated to making dreams become a reality. I accomplished one of my first dreams by becoming a walk-on running back for the University of Colorado’s Big XII Championship team. By the time I graduated I had multiple surgeries and concussions, I was beaten down. I felt like I was right back where I started, still that scared little kid that didn't know what to do next. While earning a doctorate degree I healed myself with the help of some of the greatest mind and body practitioners in the world. Through this process something miraculous happened; something changed in me that had a lifelong impact. The curriculum at Dr. Judd Institute was developed through over a decade of extensive research while working directly with student-athletes. These patent pending methods were formulated with the intent of getting to the origin of a persons issues so they can live more authentic lives and not be controlled by the fear and trauma from their past. Dr. Judd Institute’s global mission is to help others heal themselves in both mind and body. I have worked in the field of Sports and Life Coaching for over 20 years as a teacher, performance-enhancement coach, head football coach, track coach, advisor, and consultant for teams and individual athletes. Preston Dewey, former quarterback for The University of Miami Hurricanes. I work with athletes across all competitive levels, including high school, college, professional, and elite (i.e., Olympic). Locally, the scope of my practice starts with student-athletes at Boulder High and Fairview where I’ve had the honor of coaching with Coach Tom McCartney. 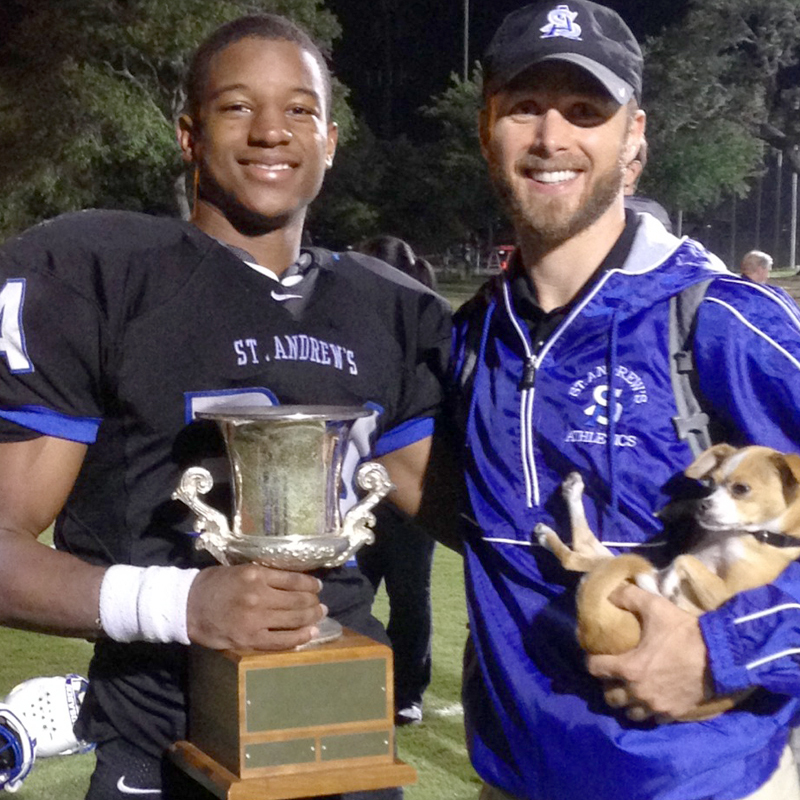 Brandon Hawkins, former star running-back for St. Andrew's Crusaders. I provide student-athletes with the mentorship and overall support that I desperately required as a collegiate athlete. My methods for life coaching ensures that athletes remain balanced and empowered to fulfill their goals, and are also able to overcome injuries by being prepared for any obstacles along the way. Joe Simonet, as seen in Men's Health. I also work with fitness-minded, driven adults who want to improve their performance and are open to a mind-body approach to living. Coach Alyssa Sawyer is a native to Key West Florida and a graduate of Florida Gulf Coast University with a background in Sport & Exercise Science with a focus on diet and lifestyle healing. Coach Sawyer was a standout cross-country runner for her university lettering all four years and recently ran the Boston Marathon. Competing at such a high level as an athlete has always complimented her wisdom for healing both the mind and body. The Chek Institute is where Dr. Judd and Coach Sawyer crossed paths and decided to join forces for an integrative approach to healing both the mind and body. Coach Sawyer has a deep understanding of functional anatomy for the effects of overall muscle imbalances and postural considerations to treat orthopedic injuries in every sport. You will experience our unique approach to preventing orthopedic injury by making special considerations that improve balance, dynamic strength, and nutrition. Due to our capabilities of training multiple sport athletes we teach everyone how to identify instabilities, being corrective postural or life issues that have been holding you back from high performance in every area of your life. We live them, and require those we work with to keep each other accountable as well. Unfortunately, very few professionals seem to lead a healthy life in both mind and body. By taking a Mind & Body approach to living we are conscious of what sources our decisions in life. We challenge you to do the same. Most clients that enter our office do not do so on a winning streak. Physical and emotional pain is trying to teach you a lesson, and we are here to help you not only feel better, but to become better! As you see in the diagram below Dr. Judd had a myriad of injuries throughout his athletic career as a college football player. These injuries were a wake-up call from the pain teacher that were complemented by unresolved emotional pain from his past. Pain will always manifest itself in very unique ways through our thoughts and how we feel physically; To heal we must have a synonymous approach for both the mind & body. First, when you are injured you experience suffering because you have lost a piece of your health. 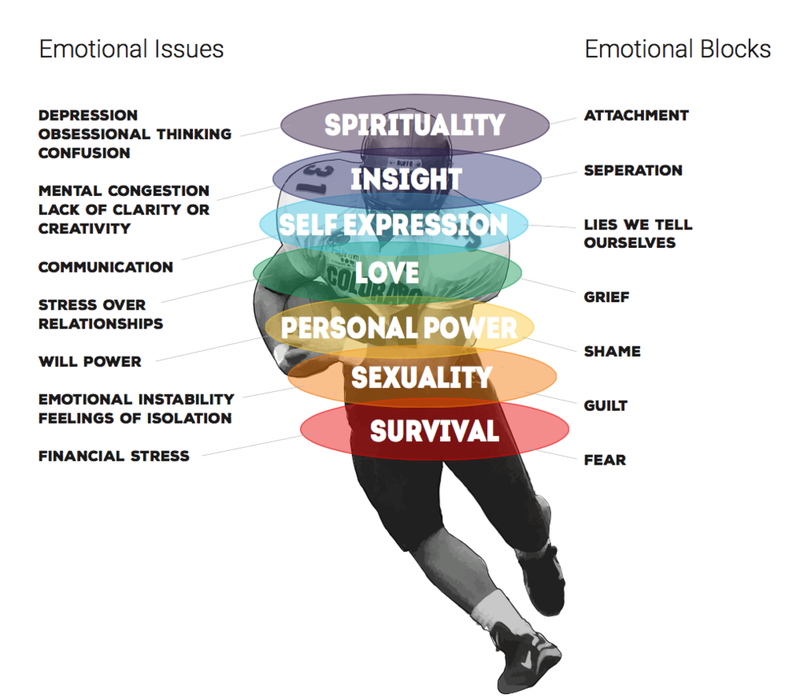 Second, every athlete that we work with has experienced unresolved issues (e.g. financial strain) that can be traced back prior to an injury. Only when we start to connect to what are bodies are teaching us can we become pain free and perform at our highest level in life. To pursue what we love we must have a strong foundation. We maintain this foundation through how we eat, move, rest, and play. When we practice these values on a daily basis we remain a living example of how to balance ourselves, which provides fulfillment in our lives. Dr. Judd has designed a Foundational Test that provides a detailed assessment of each area of your life. After taking the Foundational Test you will have a clear visual representation of what areas need improvement and the specific actions to implement for remaining balanced in both mind & body. Joy can be taught by explaining the difference between self-acceptance and self-esteem. Self-esteem is dictated on how you have relied on the external (world’s acceptance) to feel good about yourself. This kind of dependence on external validation does not allow authenticity in creating the life that you want. After you begin to develop a love of self, then it becomes natural to love what you do. I never want others to feel the depth of pain and despair that I felt as I transitioned from being an injured collegiate athlete into my professional career. Relationships are the cornerstone to developing our Dream Team. Who are the top 3 friends in your life you discuss your dreams with and visa versa? What family members have you allowed into your life and how much energy are you willing to give to those dynamics? Does the energy you place in these relationships allow the support you need for your dreams to become a reality? Our work together will be to slowly break down unhealthy thinking while balancing out your mind and body so we see your dreams accomplished together. After completing a detailed in office assessment that targets the major areas in your life that require balance, we will come up with “action items” that need to be integrated into your daily schedule. In addition to our weekly sessions, I make myself available for periodic check-ins (10 to 20 minute phone sessions) throughout the week to ensure these action items are making a positive change in your life.